Another attractive premium cigar brand by Alec Bradley, The MAXX features an impressive blend of tobaccos from Costa Rica, Colombia, Nicaragua, and Mexico. A Costa Rican binder adds a layer of complexity to these hand-rolled premium cigars with a Nicaraguan Habano wrapper that completes this rich, medium-bodied smoke. 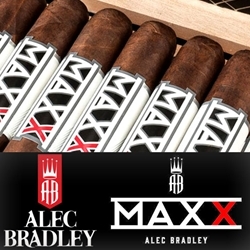 Well-constructed with a hefty ring gauge, Alec Bradley MAXX produces a great, even burn for a large cigar, yielding a toasty smoke with alluring undertone notes of smooth and pleasant cocoa and coffee flavors. Cigar connoisseurs of love a wide-body cigar will really enjoy the satisfying smoking experience offered by one of the best premium cigar brands on the market today, Alec Bradley! Smokers Discounts offers the perfect way to unwind with Alec Bradley MAXX premium cigars. Every cigar purchased on our online cigar store can be delivered right to your front doorstep. We’ve made it easy and affordable to buy hand-rolled cigars. A variety of sizes and flavors are listed below, each of these styles are in stock and available for a low discount price! Call us for more details!